I'm so excited to be heading to Salt Lake City tomorrow for Stampin' Up! OnStage. It's such an exciting and inspiring event - lots of excitement with new products and a great opportunity to meet new demonstrators and catch up with old friends! This year I signed up with an organized card swap and a "card candy" swap. I wanted to share my swaps with you. First my card for the card swap. This is a variation of a 3x3 card I made for a swap in April using a water colour technique on the card from in Flirty Flamingo and then Pumpkin Pie and Daffodil Delight on the butterfly stamped and cut out from the In This World stamp set (Item 142652). 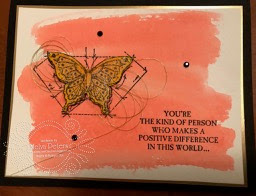 There is Gold Metallic Thread behind the butterfly and some Black Rhinestone Jewels to add a pop! Now for the Card Candy Swap. I've never participated in one of these before, but it sounded like fun. You make a 2x2" "card" that can be used on a card front or as part of a collage. The theme was holiday or Happy New Year from the Holiday catalogue. 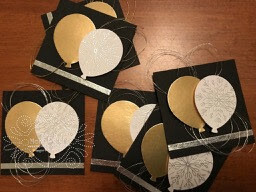 I used the balloon punch to punch out balloons from Gold Foil and Year of Cheer Designer Series Paper. I added a strip of gold or silver Year of Cheer washi tape and some gold or silver Metallic Thread. I'm excited to see what I get in return in both swaps! Stay tuned and I'll share more pictures over the next few days from OnStage! 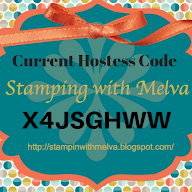 If you want to place an order while I'm away, just click on the Order Stampin’ Up! Online Now button on the right side of the screen to go directly to my online store, or click here or drop me an email if you have any questions. 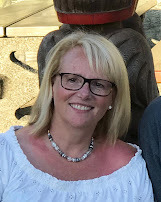 I may be a little delayed in responding to emails, but I will return your email as soon as I can!